Using proper safety protocols around trenches is literally a life-and-death matter. Read on to ensure you’re following the guidelines. Last month, New Jersey landscape company officials pleaded guilty to criminal charges of failing to properly shore up a trench that caved in, suffocating two laborers. The charges against the company and two individuals are punishable upon conviction by up to 18 months in prison and a hefty fine. The U.S. Department of Labor’s Occupational Safety and Health Administration (OSHA) already fined the company $77,000, following an investigation that uncovered the men were installing a French drain system, working in a trench between 9 and 13 feet deep, which had no cave-in protection. OSHA requires all trenches and excavation sites 5 feet or deeper be protected against sidewall collapses. Here’s a checklist of trench and excavation site regulations and safety precautions, provided by the National Association of Landscape Professionals. Conduct all trenching and excavation activities in accordance with federalOSHA, state and local regulations. See federal OSHA requirements at 29 CFR 1926.651 and 1926.652. Even if your company didn’t open the trench or excavation, follow regulations. 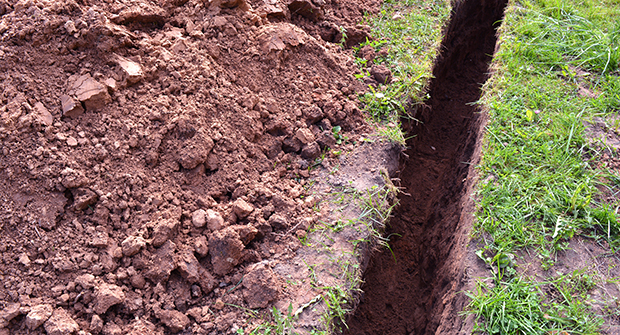 Verify the location of all underground utility lines prior to digging. Protect, support or remove underground utility lines as necessary while a trench or excavation is open. Provide a protective system when employees enter trenches/excavations that are 5 or more feet deep, unless the excavation is made entirely in stable rock. Have a competent person inspect shallower trenches and excavations to determine if a protective system is required. OSHA defines a “competent person” as someone capable of identifying hazards or working conditions that are hazardous, unsanitary or dangerous to workers, soil types and required protective systems. This person is authorized to take prompt, corrective measures to eliminate hazards and conditions. Have a competent person determine soil type using at least one visual and one manual test. Soil type is based on cohesion—how well the soil sticks together. Type A is highly cohesive, Type B is minimally cohesive and Type C offers no cohesion. Implement an appropriate protective system based on soil type and other factors, including cut depth, water content of soil and area drainage and other nearby operations. Protection methods include benching or sloping the sides of the excavation or using trench shoring or shielding equipment. Follow guidelines for benching, sloping and use of shoring/shielding equipment. Benching protects workers from cave-ins by creating horizontal levels or steps, usually with vertical or near-vertical surfaces between levels. Benching cannot be done in Type C soil. Sloping involves angling the trench wall away from the excavation. Shoring uses aluminum hydraulic or other types of supports to prevent soil movement. Shielding protects workers with trench boxes or similar types of supports. Ensure a competent person supervises the work and inspects trenches and excavations, adjacent areas and protective systems daily and as conditions change (after rain, for example). This must be done before crew members enter. Provide proper access and egress to trenches and excavations. Federal OSHA requires ladders, steps, ramps, runways or other means of safe exit from trenches/excavations 4 feet or deeper. These devices must be located within 25 feet of all workers. Train crews to work safely in and around trenches/excavations and wear proper personal protective equipment (PPE). Provide walkways or bridges with standard guardrails where people or equipment are required or permitted to cross excavations deeper than 6 feet and wider than 30 inches. Protect crew members from loose rock, dirt, materials and equipment that could fall into the excavation or trench. Spoil piles and other materials must be kept at least 2 feet from the edge of the excavation, and/or retaining devices must be used to prevent material or equipment from rolling into excavation. Test for atmospheric hazards such as low oxygen, hazardous fumes and toxic gases when a trench/excavation is more than 4 feet deep. Prevent crew members from being exposed to low oxygen levels and other hazardous atmospheres. Keep emergency rescue equipment, such as breathing apparatuses and a safety harness and line, readily available where hazardous atmospheric conditions exist or could be expected to develop. Don’t allow crew members to work in excavations where water has accumulated or is accumulating, unless adequate precautions have been taken. Possible precautions include the use of water-removal equipment and safety harnesses and lines. A competent person must oversee these operations. Keep heavy equipment as far as possible from trench and excavation edges. When equipment is operated near a trench/excavation, and the operator does not have a clear, direct view of the edge, use a warning system as developed by your company. This could include barricades, hand or mechanical signals or stop logs. If you don’t know the warning system, consult a supervisor. Before entering, make sure no loose rock, dirt, materials or equipment is located within 2 feet of the edge. If it is, notify a crew leader or supervisor. Wear a hard hat and required PPE. Enter an unprotected trench or excavation. Trenches/excavations 5 feet deep or deeper require a protective system unless made entirely in stable rock. Work underneath digging equipment or under suspended or raised loads. Place excavated soil (spoils) or other materials within 2 feet of edges. If you see materials or equipment in this area, tell a crew leader or supervisor. Stand in the vicinity of any vehicle being loaded or unloaded. On average, 54 workers die in trench or excavation cave-ins each year, according to the National Institute for Occupational Safety and Health. Cave-ins are far more likely than other excavation-related accidents to result in fatalities, and many people are unaware that soil has the power to crush and suffocate a person within a few minutes. One cubic yard of soil can weigh more than 3,000 pounds, as much as a small car, according to federal OSHA. One cubic foot of dry soil weighs approximately 85 pounds, and a cubic foot of wet soil weighs around 100 pounds. An excavation is any man-made cut, cavity, trench or depression formed by earth removal. A trench is a narrow excavation. In general, the depth is greater than the width. Other potential hazards of working in and around trenches and excavations include falls, falling objects and materials, hazardous atmospheres and incidents involving machinery. Almost all accidents related to trenches and excavations are preventable through safe work practices and protective equipment.